Each year approximately 8 million tonnes of plastic is dumped into the worlds oceans, and around 60% of this is apparently down to 5 countries in Asia (Vietnam, China, Thailand, Indonesia and the Phillipines). Now, this is not to say that they waste more per person than western countries. They don’t (it’s far less), but the main problem here is that the waste management infrastructure of these countries cannot keep up with the rapid development and subsequent increase in plastic usage. They also have large coast lines so plastic waste usually doesn’t need to travel far to reach the sea. "Over 1 million marine creatures, birds and other animals die each year from plastic trash"
Dolphins, seals, turtles, whales & fish eat them it which causes internal blockage & starvation and can get caught up in or cut by nets and lines. Please watch this video. This video is what inspired us to actively start making a difference. Seeing the awful images of the plastic straw being pulled from the turtles’ beak in the video made us think of the impact that just our little island of Koh Phangan alone could be having on marine life. Most of our TruTravels trips run through Thailand and many of our staff live on the island of Koh Phangan which happens to host the monthly Full Moon Party. Our accommodation partners on the island, Echo Beach Backpackers already strive to reduce plastic usage where they can by not using plastic bottles and having free water dispensers with reusable cups and we have participated in and organized beach cleans on Phangan and other islands (some organized by the amazing Trash Hero team). Living on a small island like Koh Phangan it is easy to see how the disposable plastic we use every day can easily end up in the sea, especially with so much tourism (and the full moon party) centered around the islands’ beaches. "177 species are directly at risk as a result of eating sea litter"
As plastic breaks down over time, little bits of it and the oily substances released are absorbed or eaten by fish and consequentially it ends up in our food. Not good. The Wildlife Trust says that 177 species are directly at risk as a result of eating sea litter, and those most at risk include sharks, whales, turtles and dolphins. Clearly we can not rely on governments and large companies to solve this problem. We can however make a difference by changing our habits and what we consume/buy. If we stop buying plastic, companies would have no choice but to stop using it. If we show governments that the public want to protect the planet, then they may listen. It is up to all of us. 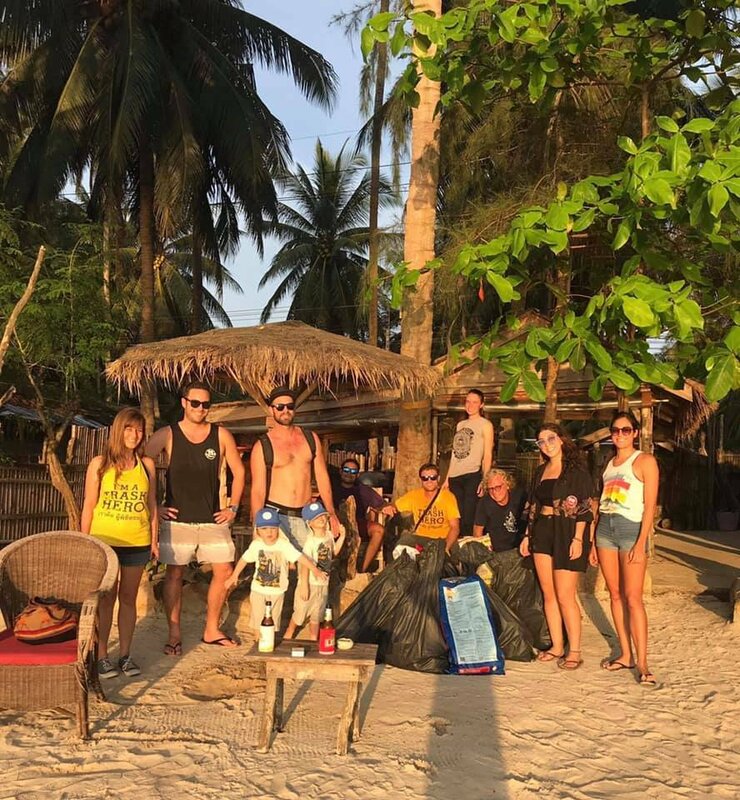 On one of our impromptu beach cleans on the morning after the Full Moon Party (possibly still slightly drunk and partying), we noticed that us and many others were picking up huge numbers of straws from the beach and the sea, as well as some plastic cups and bottles. This got us thinking… What if we could reduce and eventually eliminate the use of plastic straws at the Full Moon Parties, or even throughout the island? It wouldn’t end the problem but it would be a start and would have a significant effect on the immediate area at least. Plus it would set an example and show other islands and communities it could be done. OK, so people aren’t going to just stop using straws, however, something we can do right away and something we would encourage others to do, is to switch to using biodegradable or sustainable alternatives. Ultimately throwing away plastics. According to research by ‘Stemming the Tide’, if we keep on going at this rate, we will have 1 ton of plastic in our oceans for every 3 tons of fish by 2025. That doesn’t sound good. As you can see from the video, this plastic is extremely damaging to our marine life and what’s worse is it doesn’t break down naturally (even the stuff that does takes 100’s of years to do so) so it remains a threat to wildlife until it is either cleaned or eaten by something that may well die because of it. Improving waste management in Asia could reduce the amount of plastic that finds its ways into the ocean by 45% in 10 years, however we cannot rely on this alone. 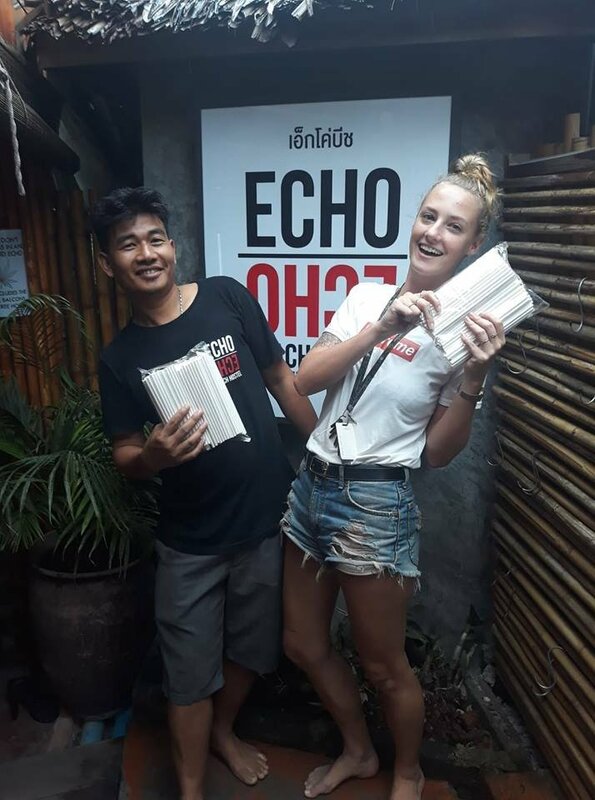 As residents and business owners in Koh Phangan (and indeed everywhere) we have a unique opportunity to make a significant difference. Love it or hate it, the Full Moon Party is what brings much of the islands customers and income. It also creates a lot of litter, much of which is plastic and much of which gets into the sea. 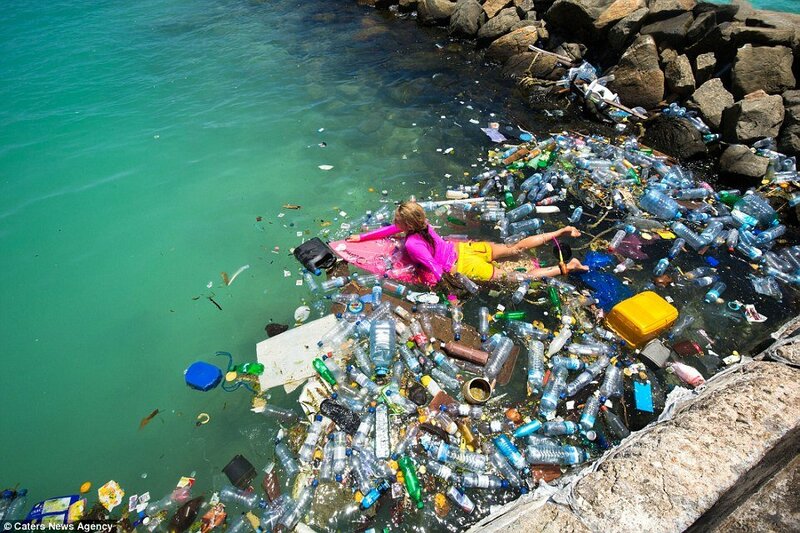 Whilst most of us don’t directly cause this, surely we owe it to the island and the planet to do something to help? What we propose is that (for a start) we all start using reusable (metal/bamboo/glass) or disposable paper straws instead of throw away plastic ones, with the eventual aim of getting the rest of the island to do the same. We have already succeeded in getting many businesses across the island on board and they now stock our paper straws which is amazing and we hope that eventually we can be a plastic free island! Another thing we can do is to stop selling bottled water. Trash hero have an excellent project whereby they sell refillable bottles for 100THB (with option to print logos on them) to any organisations who are prepared to have a refill point and give away free water to people with these bottles. This has been a very successful way of reducing plastic bottle usage (and consequently waste) over on the West Coast on Lipe and other areas so could definitely work here too if enough of us were on board. So if any of you reading this and you are on Phangan, please get involved! Obviously we are talking about Koh Phangan here but this is a global issue and everyone of you, no matter where you are in the world can do your bit to help reduce this waste and ultimately help to protect our beautiful planet. 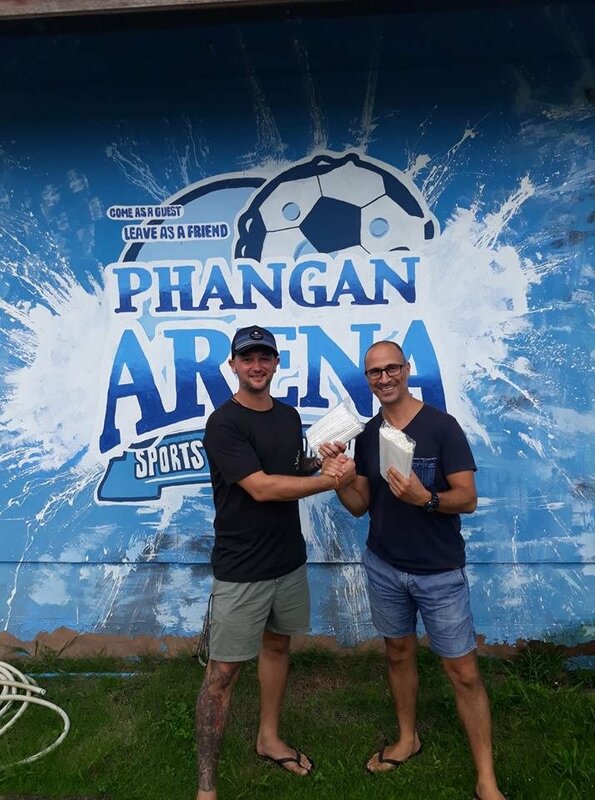 We want to see what you are all getting up to so please feel free to share your images of any projects you may be involved in and check out our Phangan Plastic Project Facebook page to track our development. To all the companies and businesses around the island who have jumped on board with supporting this movement so far, thank you so much! These are just the first steps into helping us acheive our goal of being a totally plastic free island. But if we all continue to work together, the goal won't take long to hit and then we can move on to other areas and start clearing up this planet one island at a time! <3 Let's keep it up.